Queen Kapiolani, 52nd birtday, 1886. 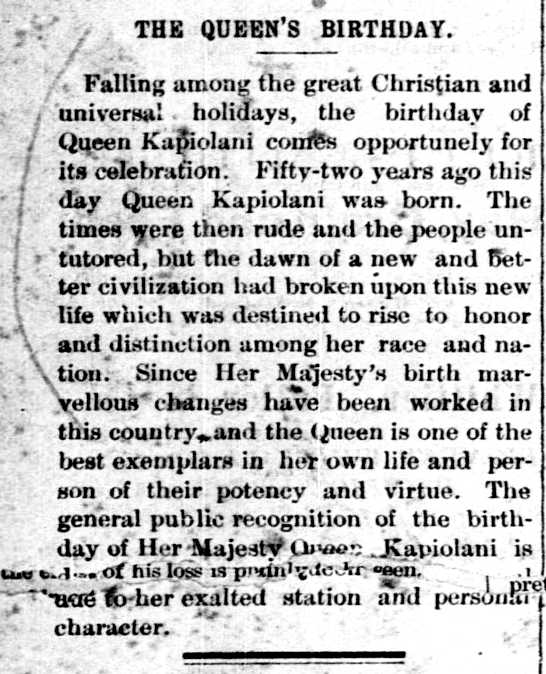 Falling among the great Christian and universal holidays, the birthday of Queen Kapiolani comes opportunely for its celebration. Fifty-two years ago this day Queen Kapiolani was born. The times were then rude and the people untutored, but the dawn of a new and better civilization had broken upon this new life which was destined to rise to honor and distinction among her race and nation. Since Her Majesty’s birth marvellous changes have been worked in this country and the Queen is one of the best exemplars in her own life and person of their potency and virtue. The general public recognition of the birthday of Her Majesty Queen Kapiolani is due to her exalted station and personal character. The Pacific Commercial Advertiser, Volume V, Number 310, Page 2. December 31, 1886. New flag of Queen Kapiolani, 1885. This morning, precisely at eight o’clock, a very interesting ceremony took place at the Palace. 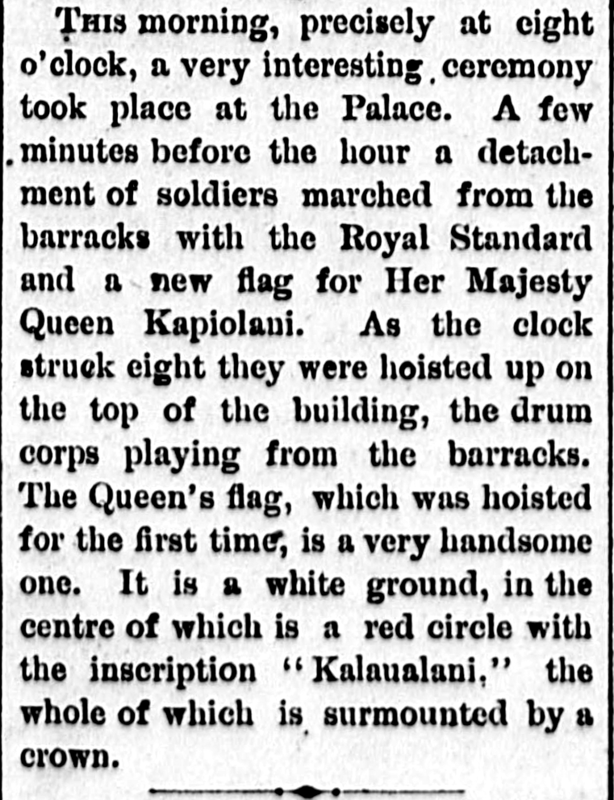 A few minutes before the hour a detachment of soldiers marched from the barracks with the Royal Standard and a new flag for Her Majesty Queen Kapiolani. As the clock struck eight they were hoisted up on the top of the building, the drum corps playing from the barracks. The Queen’s flag, which was hoisted for the first time, is a very handsome one. It is a white ground, in the centre of which is a red circle with the inscription “Kalaualani,” the whole of which is surmounted by a crown. The Daily Bulletin, Volume VII, Number 943, Page 3. February 12, 1885. Here is a small makana to everyone who checks in on this blog every once in a while. Just like last year, this is a calendar fashioned after one given by the newspaper Aloha Aina in 1906 to its subscribers. Click on the image and download the pdf file. You should be able to enlarge it to print even on poster-size paper if you want. Feel free to make copies and give it out to anyone you think will appreciate it! Naniloa Hotel to be sold? 1945. It was announced by a newspaper in Honolulu that the Naniloa Hotel was just sold off for a sum of $300,000, being bought by someone from Honolulu that has not been named. When W. D. Childs heard of this news, he said that it was not true. The hotel remains under their control, and it is true that a person from Honolulu wanted to arrange a purchase of the hotel, but those negotiations did not work out. Therefore, the news in the Honolulu paper about the selling of the Naniloa Hotel was misguided. Ka Hoku o Hawaii, Volume LX, Number 21 , Aoao 1. Okatoba 17, 1945. Hattie L. S. Reinhardt runs for representative as a Democrat, 1944. I give my thanks once again for your votes and support to elect me as the Woman Representative Candidate for the district of East Hawaii. I stand before You, Hattie Linohaupuaokekoolau Saffery Reinhardt, the Hawaiian woman Candidate for Representative as a Democrat. 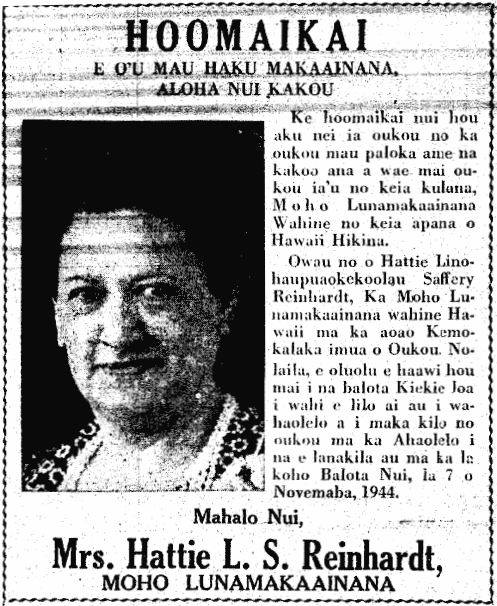 Therefore, please once again give me the Greatest votes so that I may become a spokesperson and someone to watch over the Legislature, if I win in the General Election [la koho Balota Nui], 7th of November, 1944. 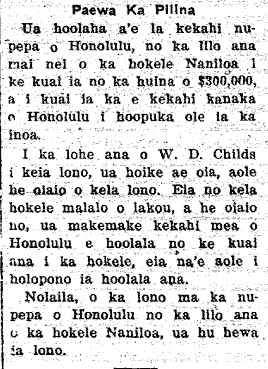 Ka Hoku o Hawaii, Volume XXXIX, Number 25, Aoao 2. Okatoba 18, 1944. 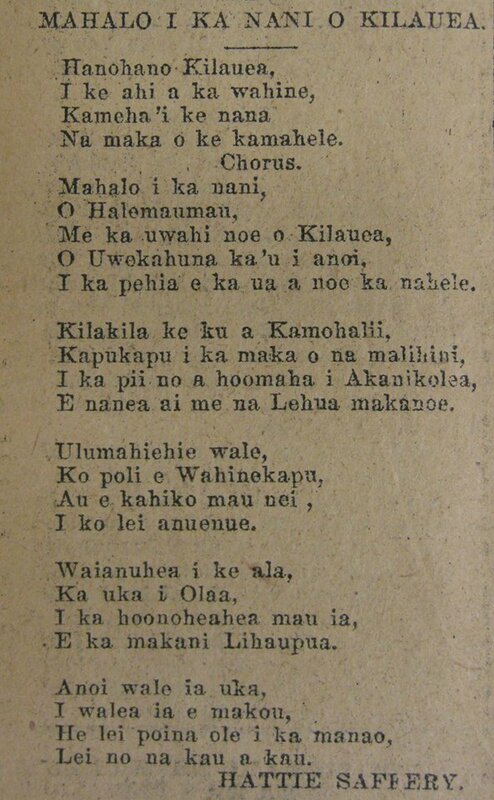 A song extolling the beauty of Kilauea by Hattie Linohaupuaokekoolau Saffery, 1920. MAHALO I KA NANI O KILAUEA. Na maka o ke kamahele. I ka pehia e ka ua a noe ka nahele. E nanea ai me na Lehua makanoe. Lei no na kau a kau. Ka Nupepa Kuokoa, Buke LVIII, Helu 7, Aoao 2. Feberuari 13, 1920.